I've always found the color "mauve" to be a little mysterious. Is it pink? Is it purple? Is it brown? Is it gray? Whenever I read about color analysis, mauve is one of the recommended colors for me (a summer), so I thought I should find out a little more about it. The first thing that I found out, is that I've been mispronouncing it my entire life. It is not "mahv", but "mov" with a long o, as in stove or clove. I'm already feeling a little more sophisticated! According to Wikipedia, mauve was named after a pale purple flower called the mallow flower. It's use didn't become popular until 1859 when a chemist trying to make a cure for malaria noticed a residue that ended up becoming a mauve dye. The 1890's are referred to as the "mauve decade" because of it's popularity! I ordered several different fabrics to experiment with that all had mauve in the names. You can see that they range in colors from kind of a pinkish brown to a dusty purple. There really is spectrum, but they all are a little "dusty" in nature. I started with the cotton jersey, which has subtle silver metallic accents on it. 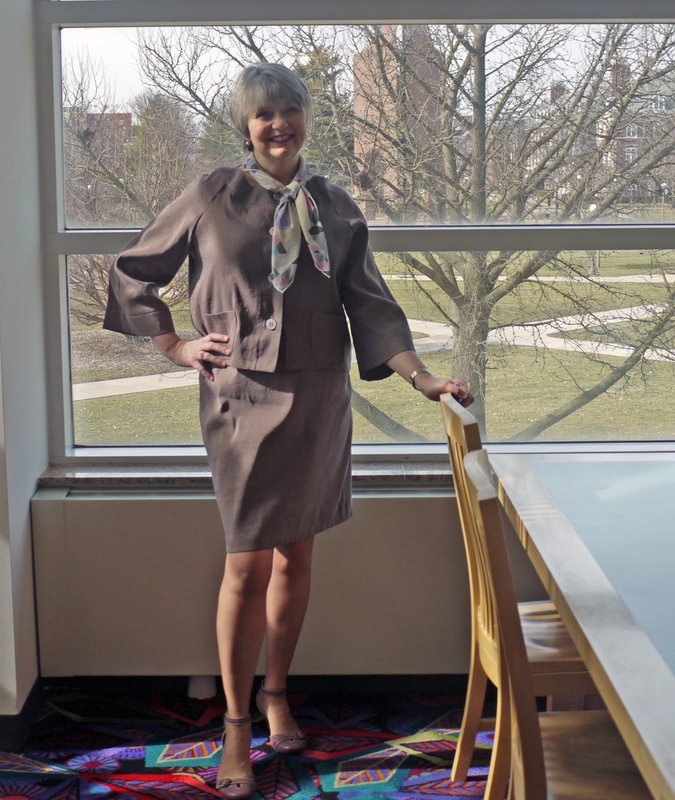 It's a lightweight and firm cotton jersey, so I thought that it would work well with something that required ruching or gathering, such as this Lisette pattern which is Butterick 6411. Here you can see the silver accents a little better. I really love the ruched overlay in this design, and it's quite cleverly constructed- much easier than it looks. I'd like to try it again in a solid knit. 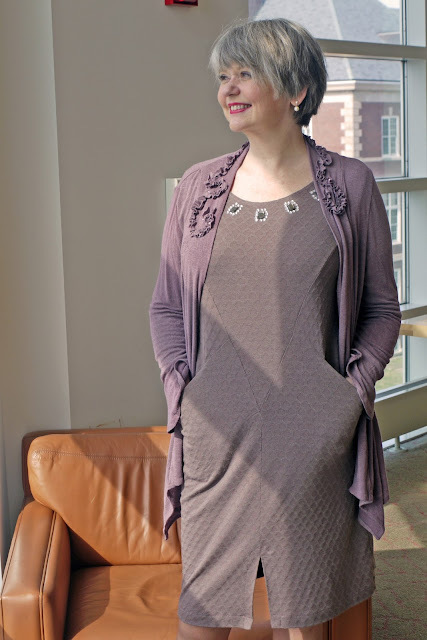 However, the dress is a little thin to wear by itself for winter, so I used this dusty mauve wool jersey to make a cardigan to go along with it. This jersey is something else- very, very high end, IMHO. It's hard to tell from the photos online, but when I got this in the mail, I knew that I had hit the jackpot! The description says that it is made in Italy. 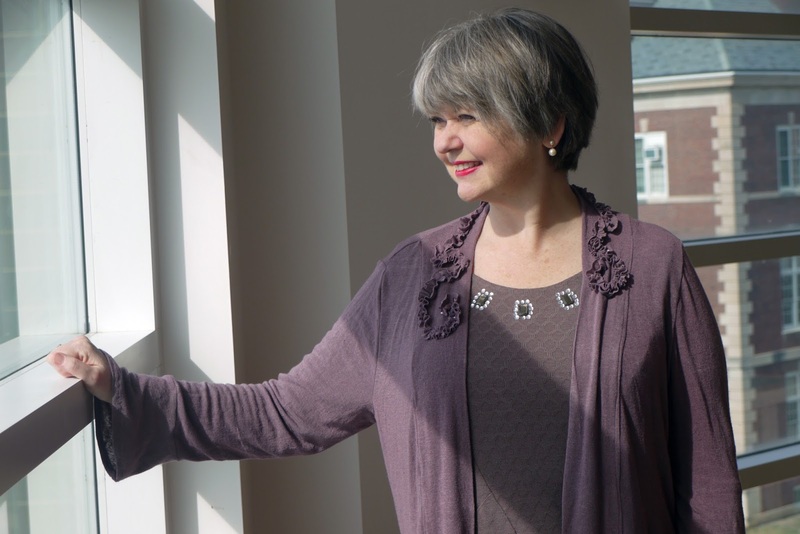 I knew that I didn't want just any old boring cardigan pattern for such a special fabric, so I hunted through my stash and found this one: Simplicity 2148. This is an out of print pattern, but I really love the details on it- the flared cuffs, the angled hem, and the ruffle detail around the neckline. The little ruffle trim is made by cutting a large circle out of the fabric, and then cutting a 1-inch wide spiral out of the circle. Then you run two rows of gathering stitches and pull it until you get a nice ruffle. I also ironed on some sequins before I gathered it. I've been watching Zelda (TV series about Zelda Fitzgerald), and have been inspired by the 20's fashions to use a little glitz here and there. I know that I'm going to get a lot of use out of this cardigan. The honeycomb knit, also is a wool knit, but a little heavier than the jersey, and I thought it would be nice in a more fitted dress. I used McCalls 7469, which is a Nicole Miller design with a boatneck. I liked everything about the pattern- the pockets, the interesting seams, the 3/4 sleeves, except I've never been a big fan of boatnecks. So, I altered it to be a scoopneck, by lowering the front neckline about 2-1/2 inches using a french curve. I also made this scarf from one of Fabric Mart's silk chiffons, and it is one of my favorites. 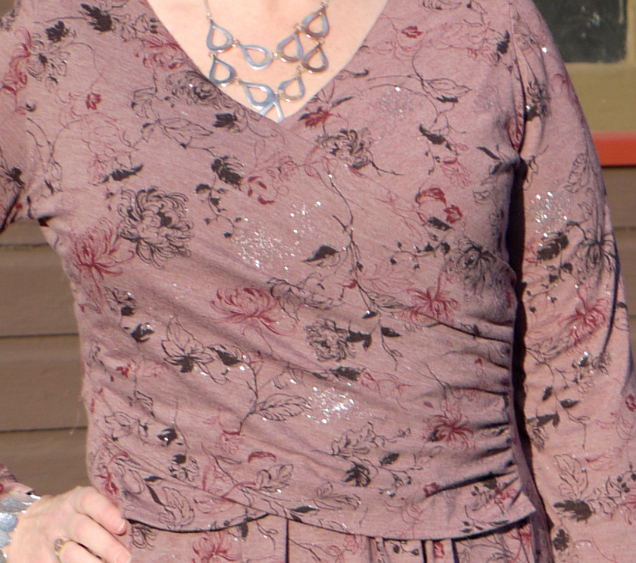 After it was finished, I thought it was looking a little plain, so I used 7 iron-on gem cluster sets around the neckline as well. This was surprisingly easy- just peel, stick and iron for about 5 seconds on the wrong side of the fabric. 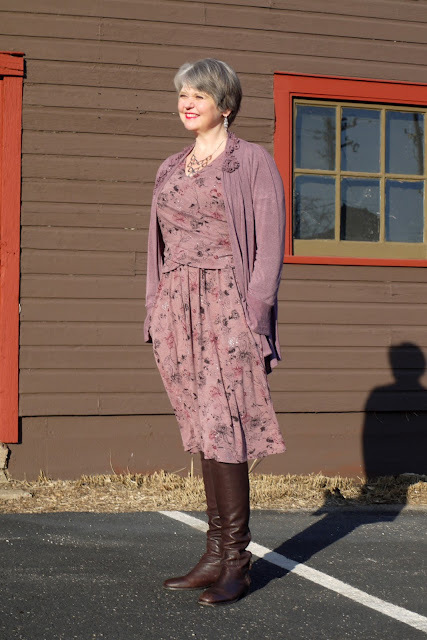 Even though the cardigan and dress are different shades of mauve, I think that this dress also works with the cardigan pretty well. Here are the details a little closer up. 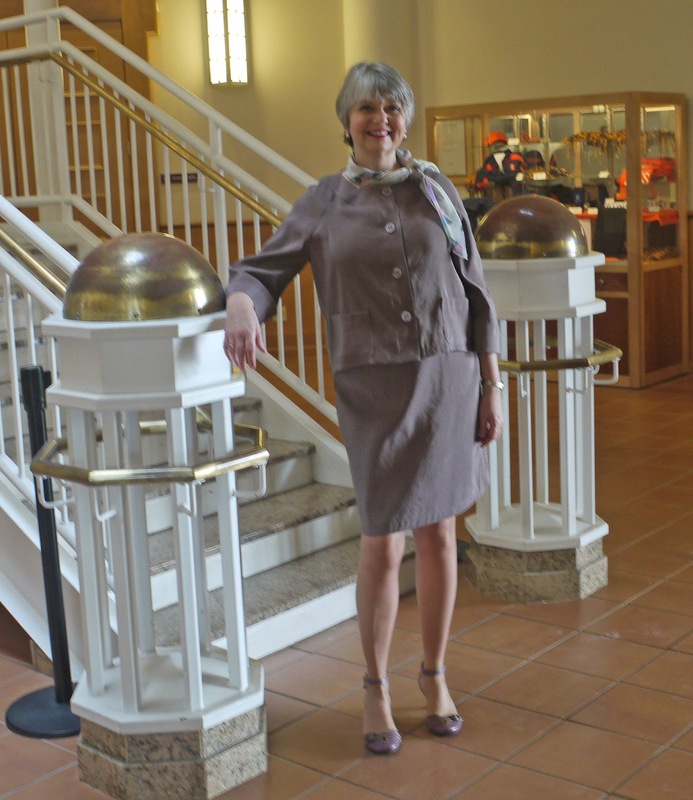 My last fabric was the faille which was a cotton poly blend. I haven't worked with a faille before, and wasn't sure what to expect. It turned out to be very stiff and rather shiny. I washed it a couple of times and the end result was very similar to a washed silk dupioni. It was less stiff, but still pretty firm, and had a rougher texture to it than before. This was kind of a wild card in my mind, so I decided to go out on a limb and make into Kwik Sew 3577. This isn't really my typical style at all, so I can't say that I'm going to wear this one. First, I think it's too big, and second, the fabric creases too easily for my taste. My daughter says that I look like I should be giving a speech. I say I look like I should be serving drinks on a PanAm flight. Neither of which will ever happen, so I don't know what I'll do with this one! It might be my styling- the scarf is vintage 1960's and belonged to my Mom- I really wanted to work it in. Maybe I'll separate the pieces and use them individually somehow. I'd love to hear your suggestions on this! But there is a silver lining because I realize that I really do like the color of this fabric- I find it to be a very calming color. It is more of a mauve taupe, and it definitely could serve as a good neutral for my coloring when looking for fabrics in the future. This has been a good impetus for me to experiment with different colors. At the end of every photo shoot, my photographer demands a latte. A great way to relax and enjoy a little more mauve! Your clothes are wonderful and you look so good in this color. I would have passed right by mauve but now will be looking for it. Thank you for the inspiration! Being a Summer/Type 2 personality and coloring your best clothes are soft subtle, drapey and comfortable. The reason the last suit does not work is that it is not any of those. If you have ever checked out Dressing Your Truth website, they explain all the aspects of your special personality besides the colors. The energy that Type 2 people radiate is gentle and connected and flowing like a river. Scarves are a huge part of the personal and softness in fabrics. Here is one example of a Summer Type 2 collection of dresses that make the most of the personality and energy: https://shop.liveyourtruth.com/clothing/dresses.html?___store=type2 Your flowered dress is the perfect pattern/shape, fabric and color for you along with the sheath dress and jacket...soft drapey and comfortable. I'm sure the stiff jacket could work with other things with the scarf to soften the look, maybe some drapey pants. Thanks for sharing! My client Nancy is Summer/Type 2 and it is fun working with her to make the most of her energy and personality while keeping things soft and feminine. That is so interesting! I love all of the dresses on that page, so will have to look for inspiration on that site. I do think that you are right- I was immediately concerned about the stiff fabric when I received it because I just don't often wear things that don't have a little give to them. I also love scarves! All of your pieces are just lovely and I always feel like a learn something from your posts, so thank you! As far as the As far as the kwik sew jacket, maybe, as you stated, breaking the pieces up would help. In my opinion the jacket appears dressy so maybe pairing it with jeans and leaving it unbuttoned to offset the piece would help tone it down to everyday wear? Thanks again for the inspiration! Thanks, Elizabeth! I will try that idea of wearing the jacket with jeans. Oh my goodness, you are beautiful!. I love all of your outfits. It is nice that the cardigan works with each look. The suit jacket would look nice worn with black slacks and a pair of low heels. Mauve is a great color on you too. Hi, Ann, I am so glad I discovered your post. I placed many orders from you when my kiddos were little, and I still have some Sew Baby fabrics in my stash that I never got around to sewing as they grew up too fast. They are in and almost in college now. I always treasure my Sew Baby connection. Your mauve experiments are terrific. Too bad about the KS jacket. I agree wit your opinion that it looks too big. And maybe some shaping with bust darts would be good, but that sounds like more work than it's worth. Anyway, Happy Sewing. Oh, that is so good to hear! My kids are all in their twenties now too, so I have done little baby sewing except for the occasional baby shower here and there. Definitely some bust darts would have been a good idea! Live and learn, right? I love the two dresses as well but think the suit is not quite right. I believe you are on the right track that the jacket is definitely too big and might be better if it was a smaller size. but you might be able to salvage it by using them as separates. Thanks, Lucky Mom. I will keep experimenting with them. Really pretty pieces Ann! I most love the cotton jersey! I would try wearing the kwik sew pieces separately or take in the jacket? Anyway, great work! I think the mauve looks great on you. I think the jacket does look too big. But the other garments are all lovely. Gorgeous new garments and I love that color on you. Beautifully done. Perhaps "mov" is your new black and your pieces can find their way to mix and mingle with others in your wardrobe? Thanks, Linda. I did wear it Friday with a t-shirt and cream pants and felt like it worked all right. Still need to do some tweaking with the size though. What a beautiful collection! I think mauve is a tricky color to wear, but you have just the perfect coloring for it. This color absolutely comes alive on you! I really like the vintage feel of the jacket and skirt. Even though the faille yielded a jacket that's maybe a little different than your usual styles, I think you carry it well, especially with the beautiful vintage scarf! Thank you Elizabeth. I like that style too- and might try it again with a less stiff fabric and working in a smaller size. 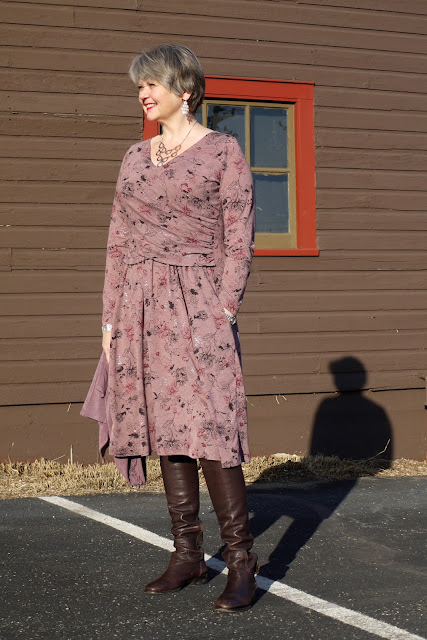 I think mauve is a great neutral for you! Love the first three looks; Re the jacket: The belled sleeves bother me--not sure why, something about the proportion--maybe they're too long? Or see what they look like more narrow? I also think the jacket should either be worn open, or maybe use some more of your cute crystals or a trim to highlight the neck and front bands??? 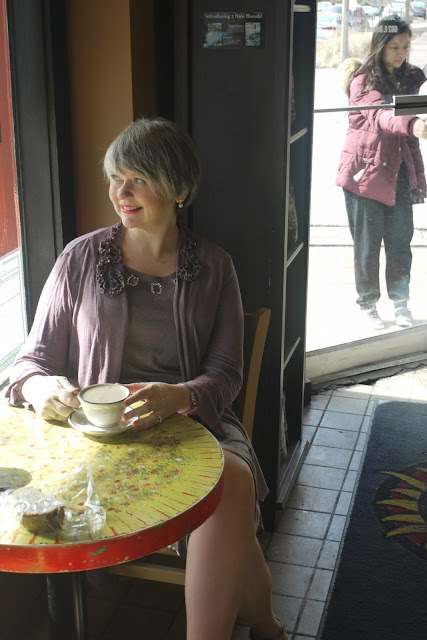 Do you have scraps of the cotton and wool knits that could make a top to go with the skirt? Love the mauve group! Hmm.. That's a thought- maybe I will cut off the sleeves to the short sleeve length. At that point it wouldn't be too hard to narrow the whole underarm and side seam too. I had virtually no scraps from the other projects left this time, but I'm sure that I have some other fabrics that have that color in them! You look fabulous in "mov"! But the suit is so stiff and formal. The softer garments definitely suit you better. I was recently introduce to "Dressing your Truth" concept and have been watch some Youtube videos. Not sure I buy in on the concepts. I have the cardi pattern and have never noticed the ruffle trim detail. So interesting. Thanks, Audrey. Yes, the ruffle trim is kind of hard to see in the little photo, but it really is a fun detail. I'll keep looking at the Dressing your Truth pages- it's interesting for sure! I have seen Peggy Saggers from Silhouette patterns wash harsh fabrics in a can of Coca Cola so soften them. One can per front load washer, no soap or fabric softener.She uses this to soften denim mostly but says it works for most fabrics. This is definitely your color no matter how it is pronounced. Love your posts.